I find the mirrored Apple logo on the back of the iPhone 4 to be convenient for the occasional “Has my makeup melted?” or “Is there food in my teeth?” check. If it weren’t for that, I’d definitely be interested in a cool mod like this glowing Apple logo. How iPatch accomplishes this is “a complete secret” and “very tricky to replicate,” says Andy Smith, the director of iPatch. “It’s not something that could be done at home without specialist equipment,” he says. The process takes a few hours. It uses your iPhone’s original rear case, so your phone isn’t any thicker when the mod is complete. You can choose the color of your glowing Apple, and it can be done to black or white iPhones. This isn’t the first time the iPhone’s logo has been set ablaze. In 2008, a Russian iPhone hack achieved the same thing, using software that allowed you to adjust the intensity of the glow. Other notable appearance-altering iPhone mods include a solid Titanium 3GS backplate, a sleek (and cheap) brushed aluminum back cover for the iPhone 4 and an iPhone fitted with a QWERTY keyboard. The mod will run you between £50 and £100 if you’re in the U.K. (that’s around $150 U.S.). 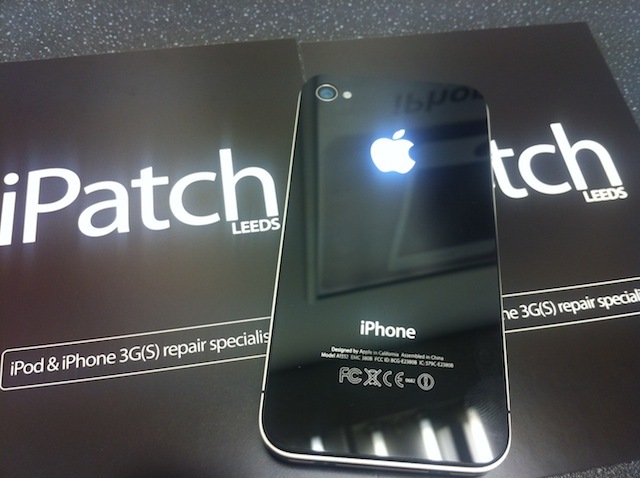 If you can’t hop across the pond to the company’s shop, you can mail your iPhone for modding. Pricing for that shipping option hasn’t been released yet, but you can check the company’s Twitter account for updates.